Ron Paul, Kent Sorenson: Payments funneled illegally for Bachmann defection. Sorenson and Paul at a 2011 event. It’s been reported that Sorenson also took possibly illegal payments from the Bachmann campaign. 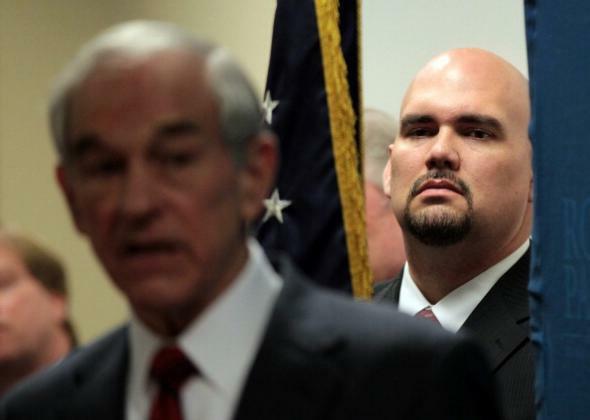 Prosecutions of figures involved in the Ron Paul campaign could be forthcoming, the Washington Post reports. The chairman of Ron Paul’s 2012 campaign, Jesse Benton, was the campaign manager for Rand Paul’s 2010 Senate campaign and is currently the campaign manager for Kentucky Sen. Mitch McConnell. Benton has not been accused of any crime, but—as mentioned in this detailed look at the connections between Ron Paul, Rand Paul, and the Kent Sorenson case by Slate’s David Weigel—he appears to have contiunued to work through at least 2013 with a company associated with the deputy Ron Paul campaign manager who is reported to have written Kent Sorenson a $25,000 check as part of the endorsement scheme.